Clinch Valley Community Action has been located in Tazewell County since 1965. But our programs and services have extended even beyond those borders as we continue our legacy of helping people help themselves. Our dedicated employees work diligently to ensure not only that CVCA’s services are delivered, but that our community is a better place to live. Explore our website to see what is available, but more importantly, call or visit with our people so we can help you succeed in your future. Make plans to come to CVCA’s Project Discovery College Fair on Saturday, April 27, 2019 from 10:00 a.m. – 3:00 p.m. in Nuckoll’s Hall at the Tazewell County Fairgrounds. CLICK HERE for more information. Tuesday, April 2 is Turn It Teal. 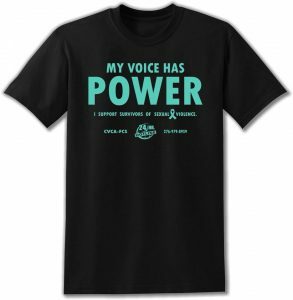 This year, we are selling T-shirts to encourage folks to wear teal and show their support of survivors & their commitment to ending sexual violence. T-shirts are $10 and are available in Adult sizes Small, Medium, Large & 1X, 2X, 3X. All shirts must be prepaid & ordered by Friday, March 15. A Our staff will deliver the t-shirts between March 29 and April 1. Please let us know if you are interested in placing an order! Our Sexual Assault Advocates, Janel Howery & Rhyli Drake will be at Restore Community Coffee in Lebanon on Friday, April 5 and at The Well in Tazewell on Thursday, April 18. Both events are from 9:00 A.M. – 1:00 P.M. Stop by & visit with our staff to learn more about our services, upcoming activities & consent. A portion of the proceeds will be donated to CVCA-FCS. Shout out to these local businesses for their support & commitment to our community! On Saturday, April 6, 2019 we are hosting our Third Annual Hike for Hope. We are hiking The Channels this year, and hikers will have the opportunity to set their own pace by selecting between two skill levels: Advanced (quicker pace) and Easy (slower pace). We are also offering a children’s hike for kids ages 6-12, with skilled guides who will engage your child in nature exploration and light hiking. FREE T-Shirts are available to the first 50 participants who both register AND attend the event! Shout out to Outdoor Adventure Centers for working with us on this event & supporting our nature therapy work with survivors!!! This event is a playful opportunity for men to raise awareness of sexual and intimate partner violence. While wearing women’s shoes as they walk their mile, family & friends will cheer them on and support their efforts!!! Each man is asked to raise $100 to support our programming. High heels are the preferred shoe for walking, men can walk in any shoe that is comfortable for them. This year’s event will be held at the SWCC Track, for both Tazewell County and Russell County. Registration begins at 3:00 P.M. and the Walk begins at 4:00 P.M.
You want me to wear High Heels??? The signature logo for Walk a Mile in Her Shoes® is red high heels. Ideally, each man who participates would wear these shoes while walking during the event. However, we know that some guys have health issues/concerns and are physically unable to wear the shoes. Others may not feel comfortable in the heels, but really want to participate. The heels are OPTIONAL. They certainly make the event fun to watch, but we want you to have a good time and to be healthy the next day! Wear them for a lap and then switch to your comfy shoes. Get your friends together and dress like Super Heroes or wear your favorite sports team gear. Our goal is to have you to Walk, showing your commitment to eliminating violence and to creating happy, healthy and safe relationships! If you would like to participate, please contact our office at 276-988-5583 or jbourne@clinchvalleycaa.org. Join us for Paint Night at Fisher & Company in Tazewell on Tuesday, April 9. Weather permitting, we will paint & dine on the patio. 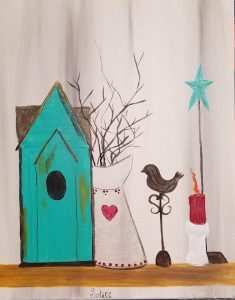 Beth Elswick of Peace, Love and Paint will be our instructor. The cost for this event is $40.00 and registration is due by Friday, April 5. Shout out to Fisher & Company for providing our delicious treats! A picture of our primitive painting is attached to this email. Each month, we ask folks to donate items for the shelter. April’s designated item is pillows. Donated items can be brought to our Main Office on Friday, April 12 from 1:00-4:00 P.M. Thank you for your generosity & support! Our convention will be held on Saturday April 13, 2019 from 12-6pm at the Russell County Conference Center in Lebanon, VA. Join us as we celebrate our community heroes and the world of comic books, anime, science fiction and pop culture!!! CLICK HERE for a vendor form if you would like to set up a space to sell items or have an informational booth for your non-profit. We plan to have panels, vendors, gaming, food & lots of fun. We are also honoring our 2019 Russell County Officer of the Year and our Every Day Heroes Art & Essay Contest winners at this event. 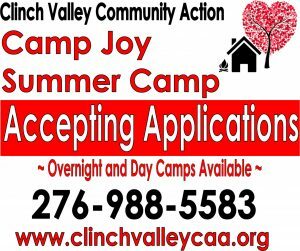 For more information, please contact Rhyli Drake at 276-889-8206 or rdrake@clinchvalleycaa.org. Cosplay is encouraged!!! CLICK HERE for flyers for the Officer of the Year Award CLICK HERE for the event. Please share. Survivor Love Letter – Tuesday, April 23 2:00-5:00 P.M. Survivors need the support of their family, friends & community. Show your support by creating letters & cards for our offices, shelter & survivor kits. Drop by our Main Office in Tazewell from 2:00-5:00 PM on Tuesday, April 23. We will have lots of art supplies – bring your creativity & help us to create a happy, healthy & safe environment!!! Camp Joy will have four weeks of camp planned for this year. Overnight Camp for children ages 6-12 will be held the weeks of June 30 – July 4 and July 7-11. Day Camp will be held for ages 6-12 on July 15-19. The week of the Senior Overnight Camp for ages 12-16 will be held on July 21-26. For more information CLICK HERE. “I am needed and I help my clients stay independent in their home…where they want to stay” — This is often said by volunteer companions with the Senior Companion Program. Clinch Valley Community Action, Inc. will be accepting Request for Proposal for mowing, weed eating, and removal of lawn clippings at Camp Joy grounds for the time period of May 2019 through end of September 2019. The Camp Joy grounds included but not limited to field, cabins, recreation center, shower house, pool area, hill side behind showers and cabins and embankment across the streams. Grounds do not include around Head Start Center or inside fenced in playground. Please submit in writing a RFP to Ricky Honaker 200 East Riverside Drive, North Tazewell, VA 24630. Or contact Ricky Honaker at 276-988-5583 Monday – Friday between 8:00 am – 4:00 pm to inspect the grounds. Contractor must provide proof of insurance if awarded bid. Deadline to submit RFP will be Friday, April 19, 2019 by 12:00 noon. Please mark CAMP JOY MOWING. RE-ADVERTISEMENT: The Clinch Valley Community Action Head Start program is accepting bids for the installation of chain link fencing at its Bland, McCready, and Apache Run Head Start Centers. Bland will entail replacement of fencing approximately 104 feet x 98 feet. McCready will entail replacement of fencing approximately 167 feet x 107 feet and re-installation of a small portion of old fencing in a separate area. Apache Run will entail installation of new fencing, approximately 650 linear feet. For additional information, including site drawings, contact Robin Boyd at 276-988-5583 x249. Federal funds will be used for this purchase; contractor must comply with Davis Bacon Act regulations. Insurance documentation must be provided. Minority and female owned businesses are encouraged to bid. Please submit bids marked FENCING by April 8, 2019 at noon to Robin Boyd, Head Start Director; Clinch Valley Community Action; PO Box 188; North Tazewell, VA 24630 or rboyd@clinchvalleycaa.org. Review of bids will begin on April 9th. Clinch Valley Community Action reserves the right to accept or reject any or all bids. READVERTISED: The Clinch Valley Community Action Head Start program will be accepting bids for cutting one tree and the removal of the associated stump, removal of an existing stump, and trimming and reshaping five (5) additional trees at its Bland Head Start Center. Bids should include clean-up and removal of all debris. For additional information contact Robin Boyd at 276-988-5583 x249. Federal funds will be used for this purchase; contractor must comply with Davis Bacon Act regulations. Insurance documentation must be provided. Minority and female owned businesses are encouraged to bid. Please submit bidsmarked BLAND TREESto Robin Boyd, Head Start Director;1379 Tazewell Avenue; North Tazewell, VA 24630 or fax 276-988-4041 or email to rboyd@clinchvalleycaa.org . Deadline will be 12:00 PM Monday, April 22, 2019; review of bids will begin at this time. Clinch Valley Community Action reserves the right to accept or reject any and all bids.